The modern world is changing rapidly, and for businesses to succeed, they need to adapt with the changing times. Year by year we have been seeing an incredible increase in internet traffic and sales. As the internet becomes more powerful and popular, business owners need to accept the fact that modern businesses have little chance of surviving without a strong web presence. Thankfully, content management systems like WordPress make building basic sites a breeze, and developers like Elegant Themes allow you to make truly professional looking sites in a matter of minutes. Elegant Themes, also known as ElegantThemes, is one of the most popular WordPress theme developers out there. They boast an impressive 86 themes and 200,000+ customers. They offer WordPress restaurant templates, blog templates, retail templates, and just about every other type of theme and template you could imagine. 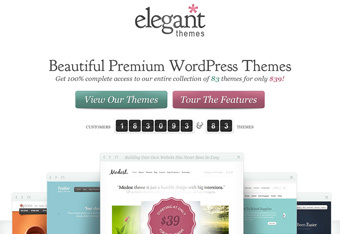 All the themes currently offered from Elegant Themes were created by the owner of the company, Nick Roach. Elegant Themes is a very professional company, with a full support staff that is ready to help you through any issues you may have. They are committed to creating aesthetically pleasing and fully functional themes, all while keeping their customers satisfied. Instead of selling individual themes and restaurant templates for WordPress, they simply charge a yearly fee, which gives you access to all of their themes and templates (currently 86). Plus, they update the themes regularly, and add new themes to the collection fairly often. While there are many WordPress development companies to choose from, Elegant Themes really stands out from the competition. Not only are all their themes beautiful, colorful, and functional, but they also offer industry-leading customer support. Whether you’re a business owner or a web designer, Elegant Themes comes highly recommended.